"Where are the missile codes?" Lionsgate has debuted a trailer for the action thriller Extraction from director Steven C. Miller. This movie stars Bruce Willis as a former CIA operative kidnapped by terrorists, with Kellan Lutz play his son out to find him and get him home. The cast includes Gina Carano who seems to be helping them, but maybe not; plus D.B. Sweeney, Dan Bilzerian and Olga Valentina. There's not that much action in this, and if anything it makes me want to watch the original Taken movie instead. Nothing but generic blandness here, only worth taking a look if you're a die-hard fan of this cast. A former CIA operative (Bruce Willis) is kidnapped by a group of terrorist. When his son (Kellan Lutz) learns there is no plan for his father to be saved, he launches his own rescue operation. Extraction is directed by filmmaker Steven C. Miller, of the low-budget films The Aggression Scale, Under the Bed and Silent Night previously. The screenplay is written by Max Adams and Umair Aleem. 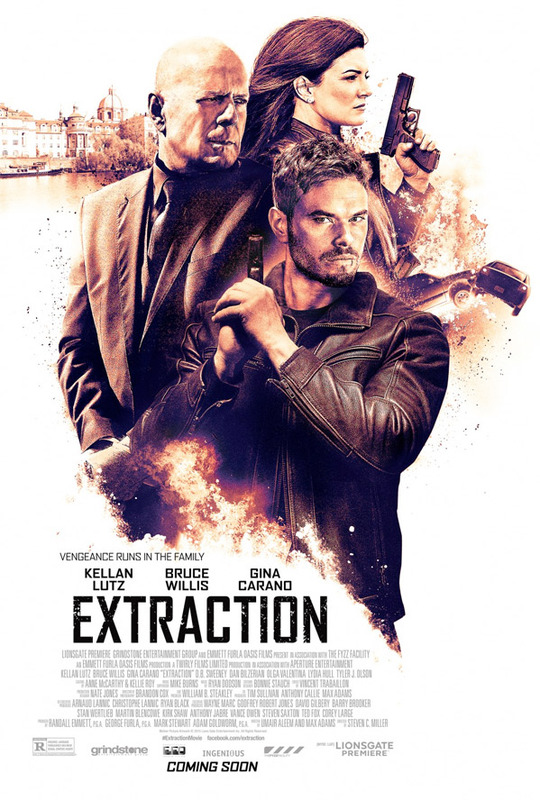 Lionsgate Premiere will release Steven C. Miller's Extraction in theaters + on VOD starting December 18th later this year. Well? I think this would be even more traumatizing than the last Die Hard. Didn't Hollywood already make a Spy Hard back in the 90's? Is this a parody of some kind? Just listen to some of the lines. Who writes this stuff? Carano is a zilch of an actor. Why has Willis started making so many of these weird C-List movies? This isn't just a waste of film, It's a waste of everything. Willis clearly doesn't even try to act anymore. He just turns up to collect his check.